Exchange data with Zendesk Help Center. Use this integration to sync your Zendesk Help Desk with Lokalise. It's a good idea to use a separate Lokalise project for Zendesk localization. Lokalise can only sync categories, sections and articles that already exist in your help center. 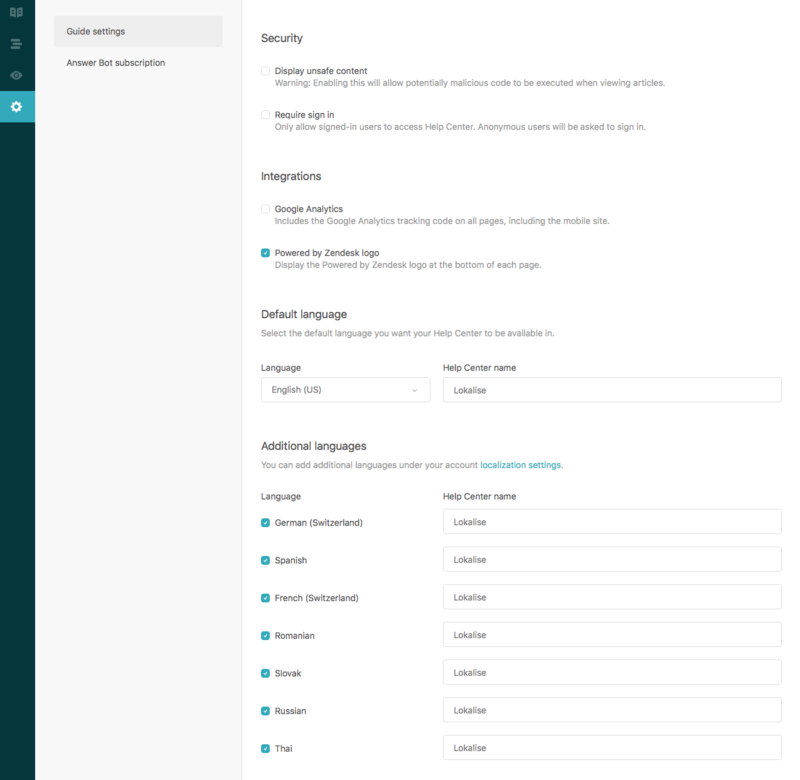 First, you must enable languages you want your help center translated to under Settings > Account > Localization in your Zendesk account. 2. Add languages to help center. As you've enabled required localizaitons you need to add them to your help center. Navigate to help center settings > Guide settings and tick the languages once again. You must create sections, categories and articles in Zendesk before importing them to Lokalise. As you click Import data button the system will import sections, categories and articles from Zendesk and create according keys / translations for title and body of each of the entities. Note, that importing would not replace existing non-empty translations in Lokalise, so if you've updated articles in both Lokalise and Zendesk, re-importing from Zendesk would not overwrite your Lokalise changes. As existing articles are imported to Lokalise you may add extra languages and do the translations. Once you're done translating, go to Lokalise integration page and press Export data. Note, that exporting would always overwrite existing Zendesk translations for the languages.